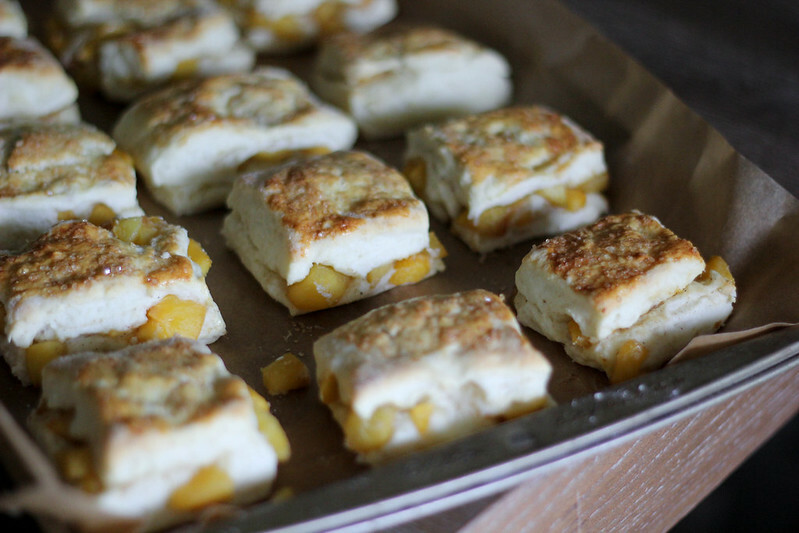 Honey Roasted Peach Biscuits …. Tales From The Roadside Vendor…..
Has it really been over a month since I visited this space? Time truly files quicker than intended; Even as you slowly make your way down a South Georgia road, in search of peaches. Along every journey, you come across someone or thing. Depending upon how profound that meeting is, it can often change the course of one’s life. When I was 11 years old I ran away from home. Got about a mile down the street and was picked up by Mr. Zechie and his truck full of pecans. He went on to explain that he’d discovered me walking and informed my grandmother that he could use my help that day. So I spent that hot southern summer day selling pecans and watermelon out of the back of his truck. Nothing like dusty gravel and 100 degree sunlight to help put things into prespective. As I laid dying of a heat stroke, I promised to never try and run away again. As a child, I never really understood why we would pile up into Granny’s old cutlass and make our way down highway US70 headed in no particular direction because either way you’ll find what you’re looking for. As time passed, I would come to understand. 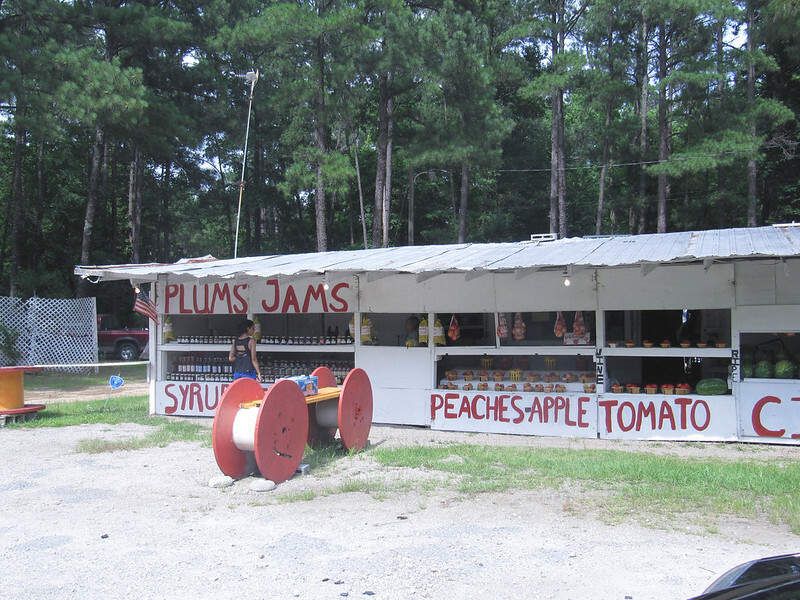 How Mrs. Ann has the best peaches, you can find her on the way to Milledgeville GA, Mr. Zechie and his flavorful pecans right outside the exit for Smithfield NC, and the gentleman that was parked on the way to Conyers GA, with the kind eyes and the sweetest strawberries. So I found myself driving one day, with no direction in particular. Looking for peaches and maybe a story or memory of some sort, one that talks of time passed that I could share with others. I discovered both on a South Georgia highway and thought I’d share in the form of biscuits. It was early July, and about 100 degrees outside when I came across a little wooden house with a sign for fresh peaches and homemade molasses. I stopped of course, I mean molasses why not. My teenage daughter was with me and noticed a crooked tree in the field along the side of the house. It stood out amongst all the others mainly because of its awkward shape but also the tree’s bark seemed to be white. We bought several bags of peaches and a few ears of corn and as we were leaving my daughter asked about the tree in the field. “Oh, the tree was struck by lightning 23 years ago, never been the same since.” Says the petite peach pusher in a worn straw hat. Fully intrigued by this twisted tree we decided to walk over to take a closer look as I regretted not bringing my camera. After a while the little lady joins us and talks about the field and how she’s witness the winds of time change these lands. Prep Time- 35 mins Cook Time- 30 mins for roasting + 10-15 mins for baking Yield A dozen + a few extra. 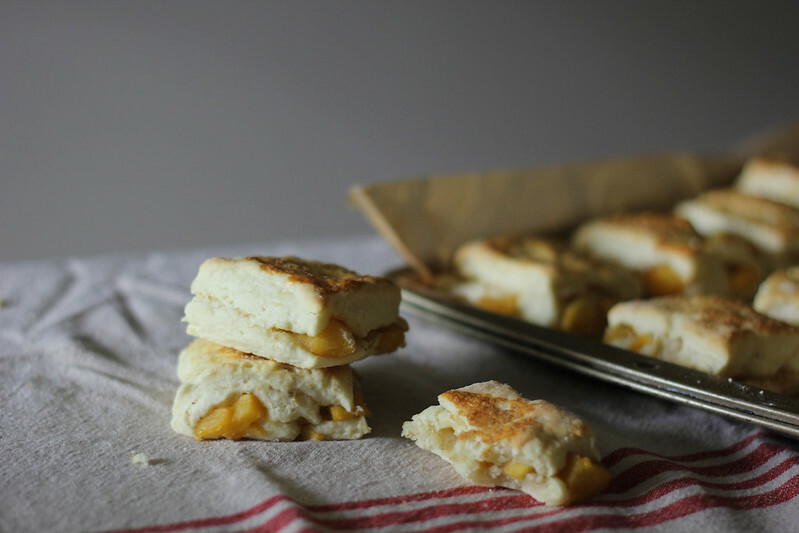 The biscuit is a basic cream biscuit; it’s the simplest way to make biscuits from scratch and can be transformed into an incredible variety of the most amazing biscuits just by adding anything from fresh herbs to peaches. 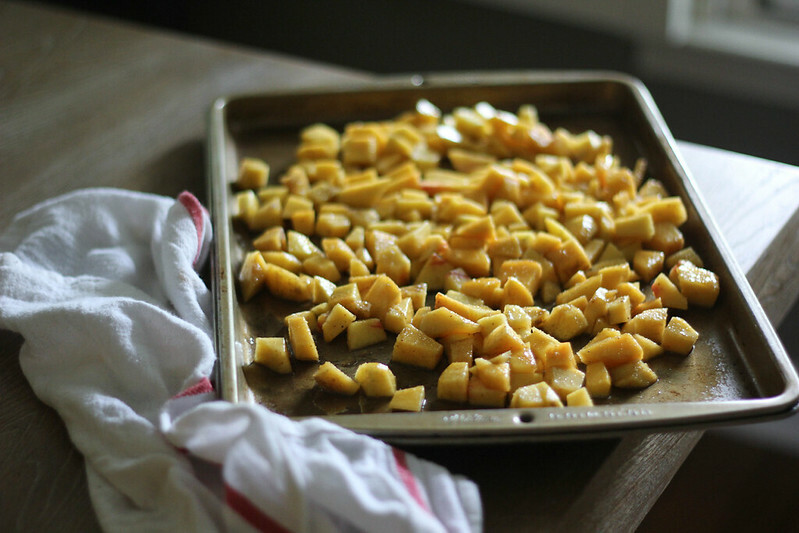 Heat oven to 350 In a large bowl, toss chopped peaches in lemon juice. Then add in brown sugar, cardamom and honey and toss to coat. Add peaches to baking sheet and roast until peaches are tender, about 25-30 minutes, turning them over with a wooden spoon about 10 minutes into roasting. 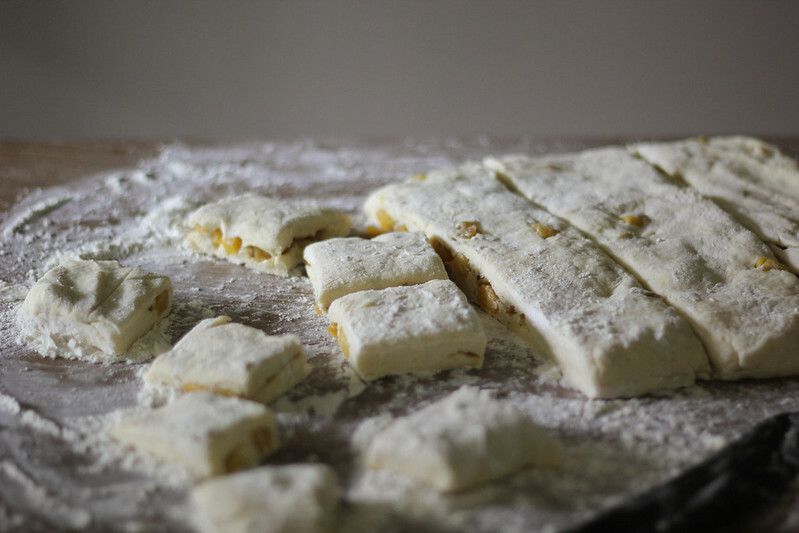 Remove from the oven and set aside to add to biscuit dough. In a separate large bowl, add self-rising flour. Make a well in the center and pour in heavy cream. Stir together just until the dry ingredients are moistened and the sticky dough begins to pull away from the sides of the bowl. 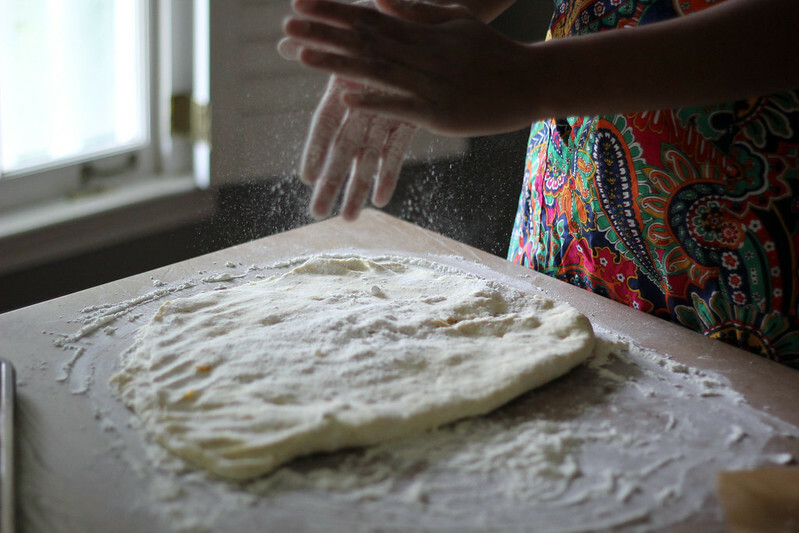 Turn dough out onto a lightly floured surface and sprinkle the top with a light dusting of more flour, Using floured hands, fold the dough in half and then pat into about ½ inch thick. Flour again if necessary and fold the dough in half for a second time. If the dough is still clumpy, pat and fold a third time. 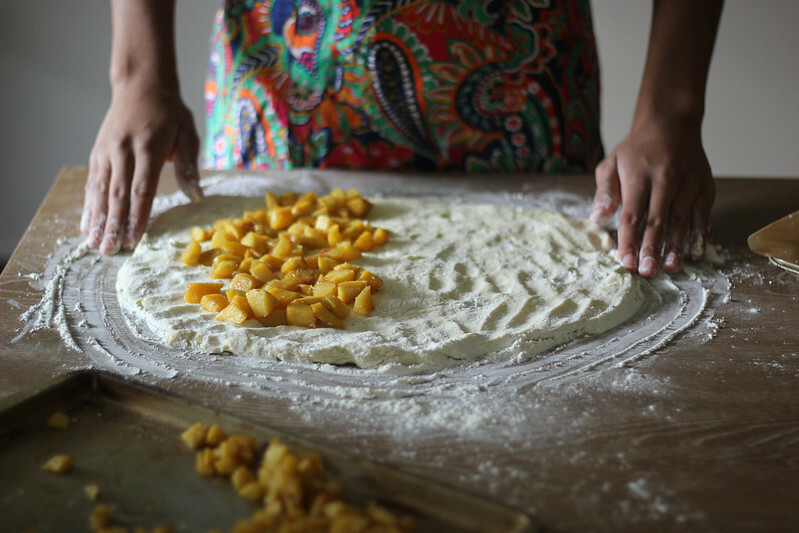 Now pat the dough out into about ½ inch thick rectangle, add roasted peaches to one side of the dough. Fold the other side over top of the peaches and gently pat down keeping the rectangular shape. 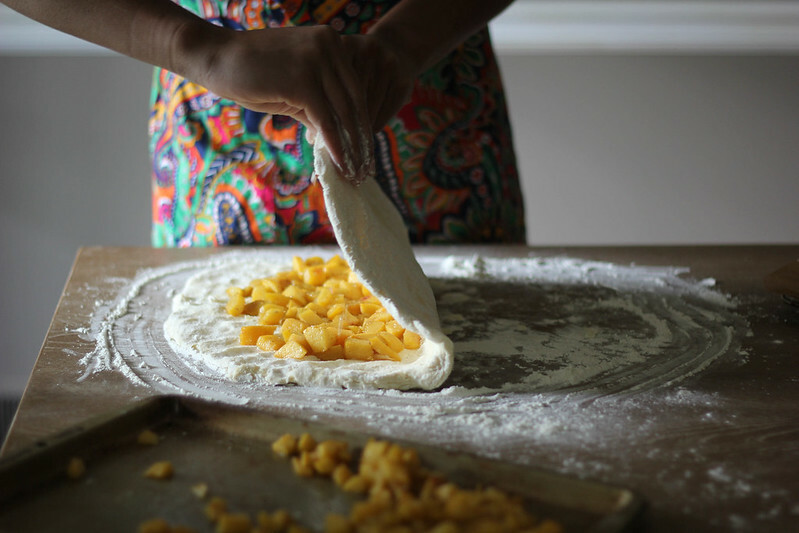 Add remaining peaches to one side of the dough and fold over top again patting gently. At this point, I used a knife to cut them into squares. Feel free to use a biscuit cutter if you want to stick with the traditional circular shape. 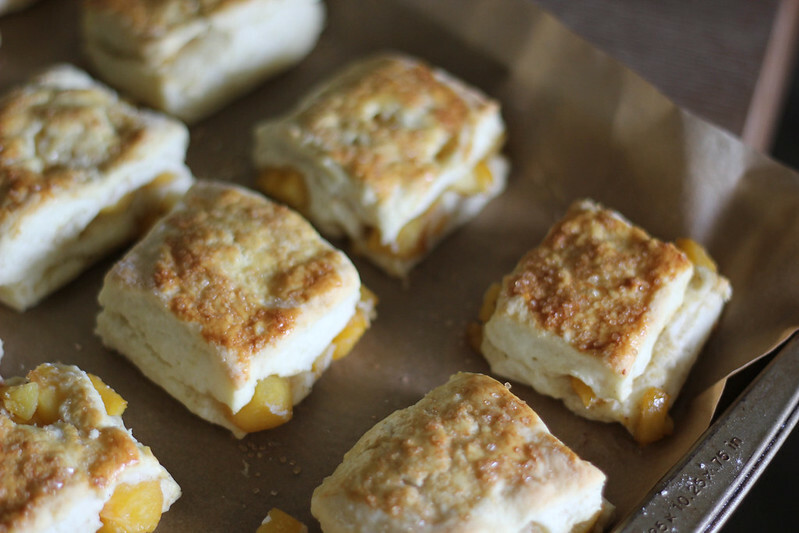 Place cut biscuits onto a baking sheet lined with parchment paper about 1 inch apart. In a small bowl, mix the egg with the cream and brush the tops of each biscuit with the egg wash. Sprinkle each biscuit with a light dusting of Turbinado sugar. This step is optional but it gave the biscuits a nice golden color with a bit of a sweet crunch on the tops. Bake biscuits in the oven for 10-15 minutes or until golden brown. Remove from the oven and serve while hot.